Have you guys seen this thing? WHERE was this when I was home feeding 2 little preemie twins at the same time!!! 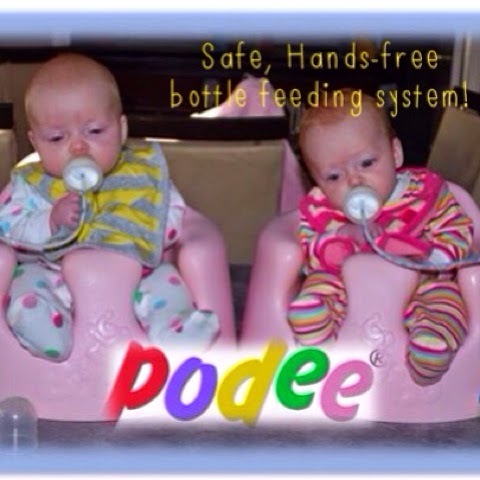 It's a hands-free system for bottle feeding your baby. This would be perfect for those times when you feel like you have to do the dishes, make lunch, brush your hair, and feed the baby all at the same time. I propped my twins on occasion and felt like I needed to check on them often in case they didn't want to drink and the milk would get all over, etc. I also worried about the milk draining down into the ears and causing ear infections (heard of it happening at a daycare). It would also be a great solution for when you need to pump at the same time as feed your baby. I think one thing moms are typically plagued with it guilt- especially moms of more than one child. You constantly feel like your diving your time between them. This gives you the opportunity to have that special bonding time with one baby while still feeding the other and then swapping the next feed. Here's the link- check it out and let me know what you guys think! !